The next day, I worked on the second set of knee blocks, on the adjacent face of each leg. 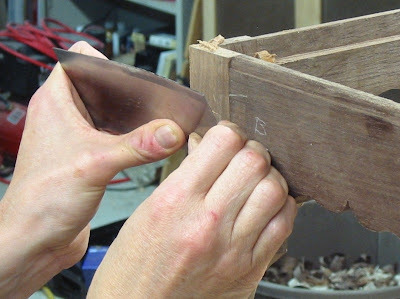 One method that simplified sawing out was to cut straight across all the small concave curves, then hollow them out from the side with paring gouges. 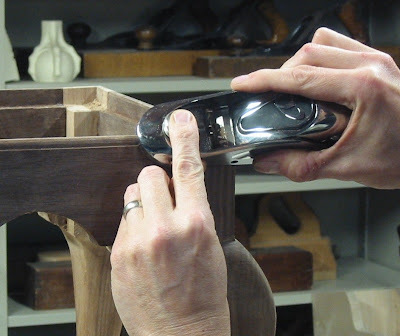 Using a light mallet touch to pare out a concave curve before cutting the knee block square off the end. This is an in-cannel paring gouge. 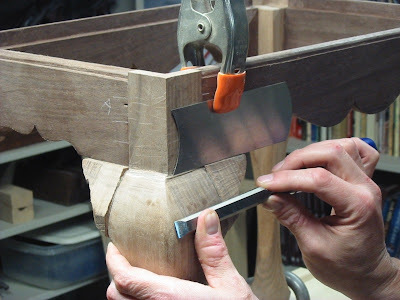 This knee block needed some adjustment to fit square into the corner between leg and rail. 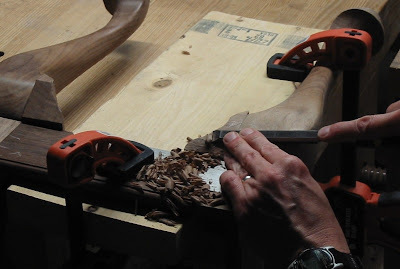 To plane fine shavings off such a small and awkward part, secure the plane upside down in the vise and move the part across the cutting edge, being careful to keep fingertips and knuckles clear. The glue-up for the four knee blocks, clamps pointing off in random directions. I let this sit overnight, then started shaping the rough knee blocks to match the outside curves on the legs. Since these are convex curves, they're done with spokeshave and chisels, which need to be sharp. 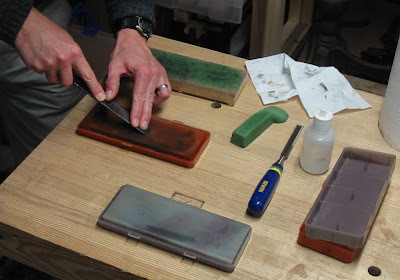 Putting a freshly honed edge on the tools with fine India stone, hard translucent Arkansas stone, and green chromium oxide rouge on a leather strop block, less than 2 minutes per tool. I had to repeat this several times during the process. The crayon-like wax rouge stick was partially melted working outside on a hot, sunny day. 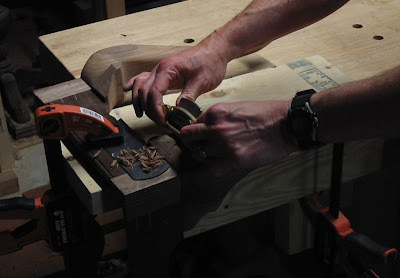 Using a spokeshave to round a knee block. 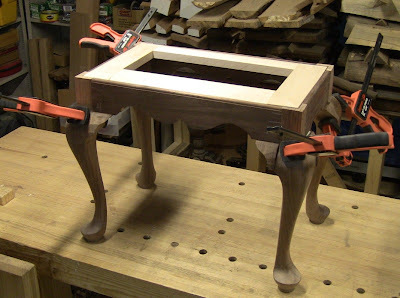 The pad feet are secured in the front-vise of the bench-on-bench. 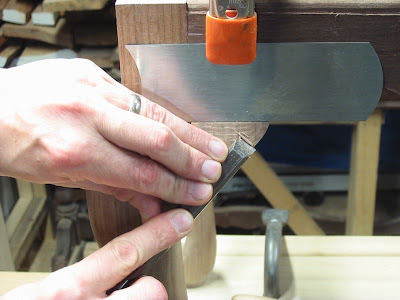 Once I've gotten as close as I can with the spokeshave, I switch over to paring across the grain, again using shearing cuts with the corner of the chisel guided by my thumb. 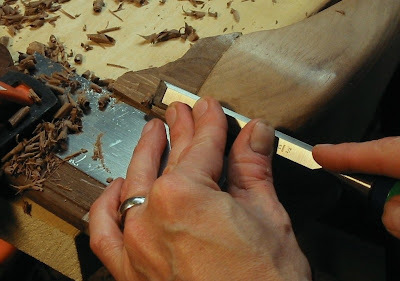 Always keep the hand clear of the path of the chisel in case it slips. At the top of the curve, cutting straight in. As before, this is all done with tiny cuts, using minimal force. Being too aggressive risks tearout or a slip that might cause injury or damage. 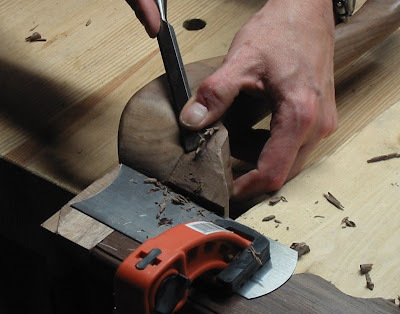 You also have to be careful around the unsupported end grain at the edge to avoid chipping it off. 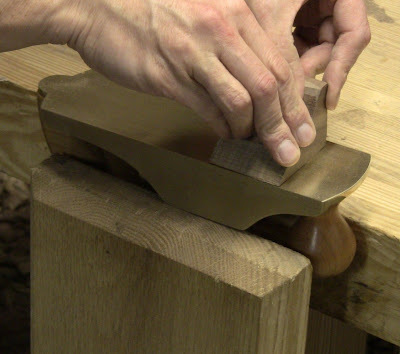 This scraper acts as a shield to keep the spokeshave body from marking the rail when it comes over the curve. 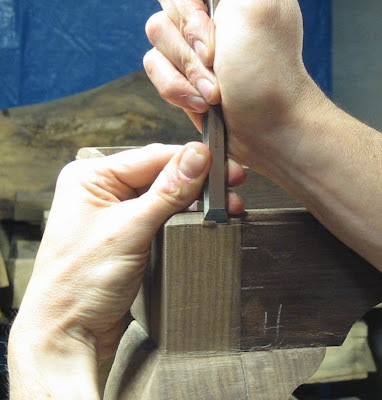 Using the chisel back as a reference gauge to check for consistent flat across the leg and knee block. More fine paring cuts, with the chisel skewed. Each block requires a slightly different approach due to grain orientation and direction of cut. Each one is a new problem to solve. For the short side knee blocks, a different clamping setup. I clamped a scrap of 2x6 overhanging the end of the bench, then clamped the stool over that. and slewing the corner through the wood. 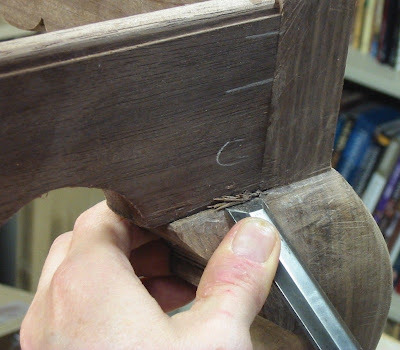 Applying Phil Lowe's tenon trimming technique: with the width of the chisel lying on a tangent to the curve, pushing the corner straight across. With the outside curves complete, I worked on the inside curves on the underside of the knee blocks. 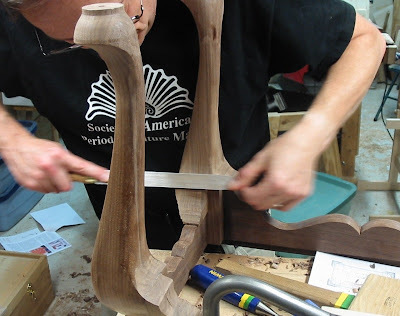 These had to continue the concave curves of the legs seamlessly. 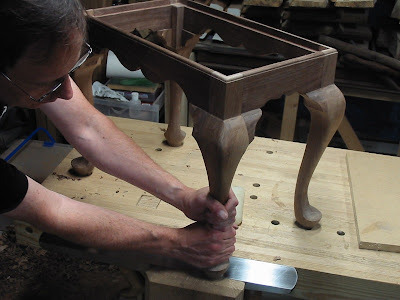 Using a chisel to bring the end of the block down flush with the end of the curve behind the leg. 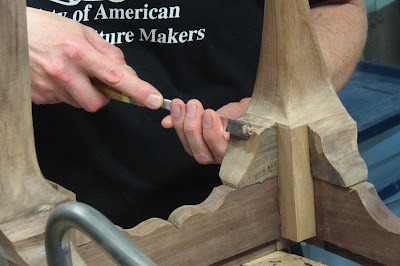 Using a shallow sweep carving gouge to take heavier cuts inside a curve. 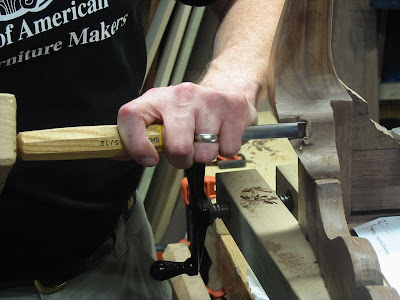 This proved to be the most effective idea of the day, using the carving gouge with hand pressure to scoop out the concavity a spoonful at a time. The scooping method allowed fast but controlled removal with minimal risk of chipping out the back side. The scooping action of the gouge left a scalloped surface, but the rasp cleaned that up quickly. I wish I had thought to use the shallow carving gouge sooner. Paired with the rasp, the two made an excellent team for shaping concave areas quickly, the curved equivalent of jack plane and jointer for flat surfaces. That would have saved some time earlier working on the legs. Final scraping of all surfaces. 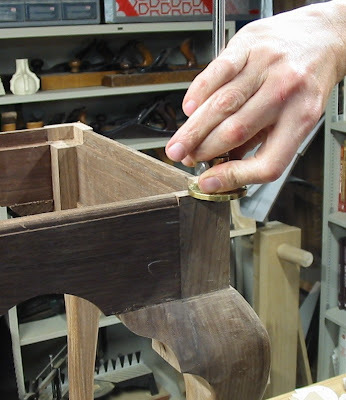 The last bit of shaping was molding the end grain on the top of the post blocks to match the rails. Delicate work, because it could chip out easily, and this is a highly visible spot. 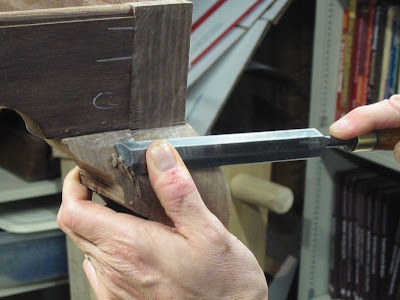 Scribing the rabbet with a marking gauge. Shaping the top quarter round, using minimum force to take tiny shavings. 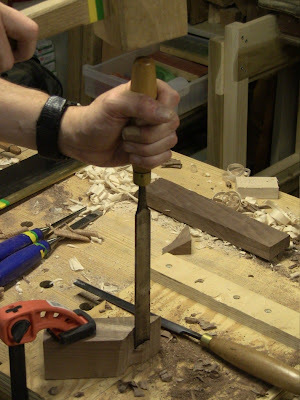 Ever so carefully nibbling along with the corner of the chisel to form the rabbet, straight down the end grain. Phil's chisel technique is a versatile one! After this, I did a little more fine tuning of edges and shapes, and I was done. There are probably a few spots that could use a little more work, but I was worried about overdoing it and ruining something. Don't let the quest for perfection push you a step too far. Better to leave well enough alone. The absolute last construction step was to level out the feet. 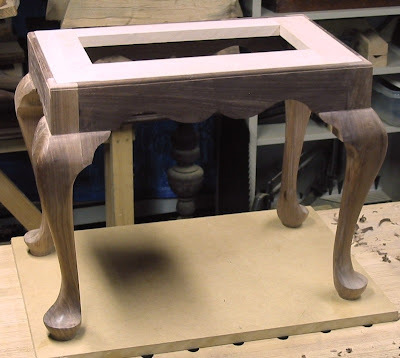 Setting the stool on a piece of MDF on the benchtop as a reference flat, one leg was too short by about the thickness of a playing card. Not bad, but I can do better. 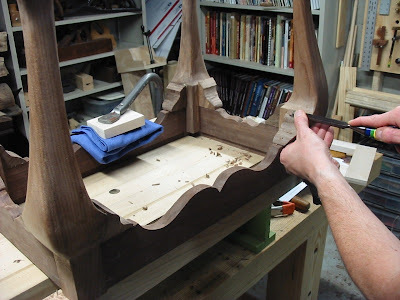 This is a trick I picked up from chairmaker Peter Galbert. Since the ends of any three legs define a plane, the fourth leg is the odd one out. 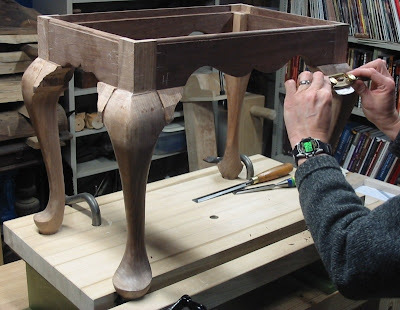 Pick the three to keep and identify the fourth leg that is too long; shaving off the length of this one will cause the rest to sit flat with it. 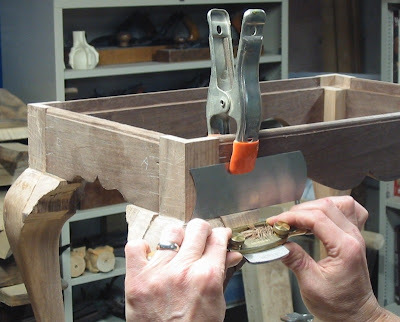 Plane it in a reverse-shooting setup: clamp the plane upside down in the vise, and drag the foot across it. Pulling the long leg across the plane to shave it to length. I did this in three overlapping passes, since this is tough end-grain. Then check to see how it sits on the reference flat, and repeat as necessary until it sits rock steady. The final task will be upholstering the slip seat. Wow! I've seen the leg even up process with the table saw, but never with the plane in the vise. Gotta try that! Thanks again for a great post. By the way, if you liked how the carving gouge worked for those concave areas, try a paring (in-cannel) gouge of medium sweep and about 3/4" width. You can pare straight across with it because the bevel is ground on the inside. It also allows you to basically skip the rasp. I hardly use my rasps after finding a nice set of paring gouges. Plus, they're super fast and leave a pollished surface behind just like paring flat end grain with a super sharp chisel. Thanks! Yes, I did use an in-cannel paring gouge like that briefly in the first photo, but I need to work on my gouge sharpening skills. It wasn't cutting as nicely as you describe, Bob. I need to make up some sandpaper-covered dowels in different grits to do the sharpening. So far I haven't had something to motivate me to work on that, but this definitely makes it worthwhile.